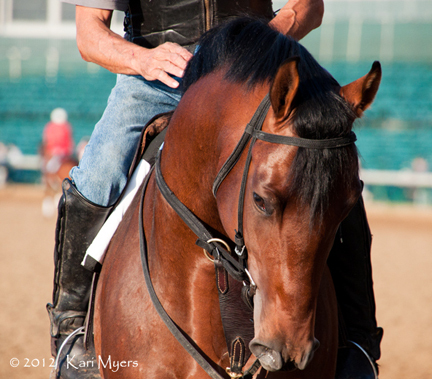 May 2, 2012: One of the many bays from the barn of D. Wayne Lukas. One of the things I enjoy most at the track is watching morning workouts. However, it’s also one of the most frustrating activities. Trainers make it easy to identify horses from their barns by tacking them up in different colors, logos, and styles when sending them out to the track in the mornings. The frustration sets in when you try to identify the names of particular horses–there are no names or numbers displayed to let you know who you’re watching. Unless a horse has tons of chrome like Shackleford or wears bright tack and pom poms like Trinniberg, it’s often quite difficult to tell who is who. Just spend an hour at the rail. It’s amazing how many bays with no markings are running around out there. Todd Pletcher alone seems to have about 30 of them! May 2, 2012: Another beautiful bay without a spot of white. May 2, 2013: You guessed it, another bay. May 3, 2012: Hey look, another one! I’m afraid I’m coming down with a terrible case of Derby Fever. I’ve had a nagging headache due to my search for a hat, and my blood pressure is slightly elevated from watching prep races. I have a front row seat this year, so it’s possible I could break out in hives at any moment due to my allergic reaction to waiting for the first Saturday in May. As is the case every year, my favorite time at the track is the early morning. Here’s a reminder of how lovely those mornings can be! I’ll be at Churchill Downs all day Thursday, Friday, and Saturday of Derby week. I simply cannot wait! 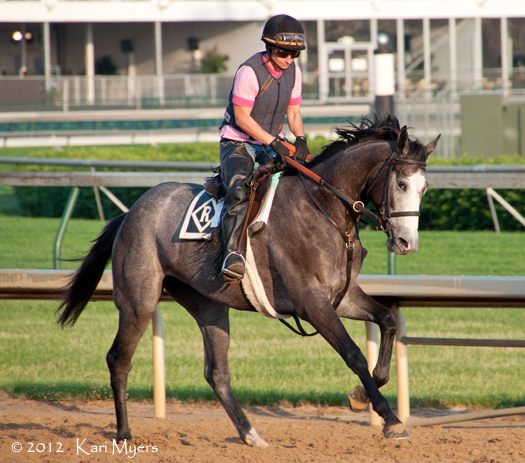 May 3, 2012: Mary Doser gallops the Dale Romans filly Perique on a beautiful Churchill Downs morning. 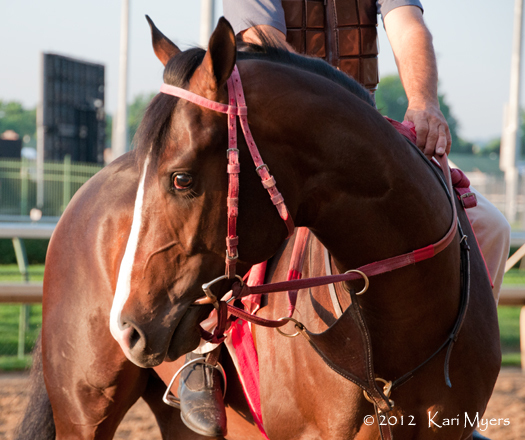 May 2, 2012: Early morning at Churchill Downs. 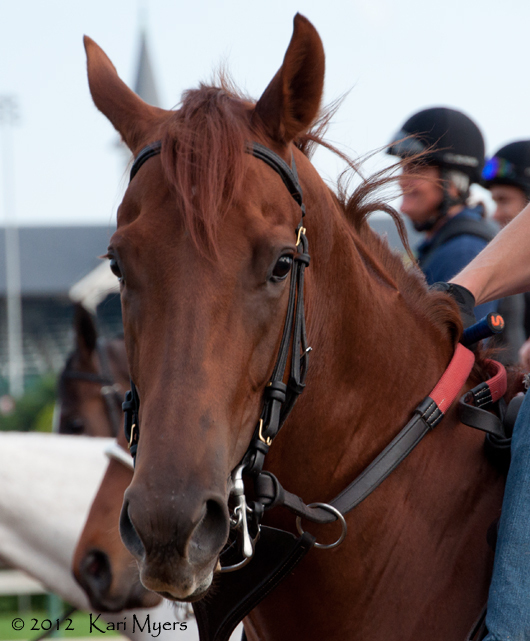 Churchill Downs provides fans with a way to get a glimpse of their favorite horses during the week leading up to the Kentucky Derby. Dawn at the Downs gives everyone the chance to head to the track in the early morning hours to catch the workouts of not only the Oaks and Derby horses, but all of the others that are out to stretch their legs. Since you can sit anywhere you want, we always get there very early and park ourselves at the finish line on the rail. 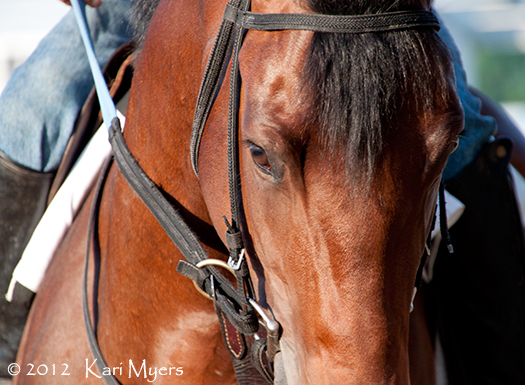 It’s a fantastic way to get up close and personal with all of the horses! 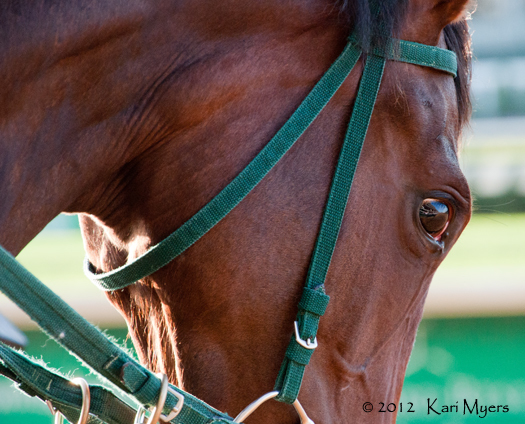 May 2, 2012: Dawn at the Downs is a great way to introduce yourself to Churchill Downs during Derby week. 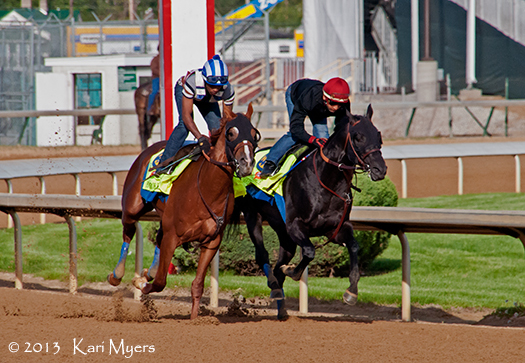 May 2, 2012: Horses line up along the rail and wait their turn for a gallop. 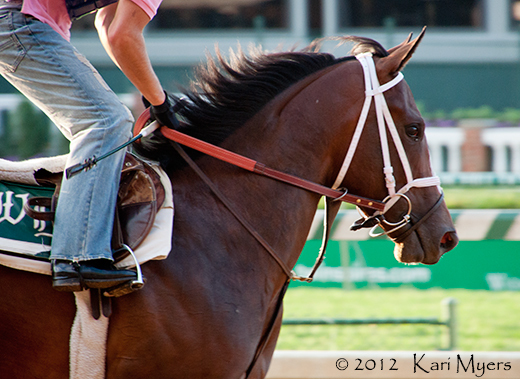 May 2, 2012: Oaks Lily warms up, jogging the wrong way around the track. 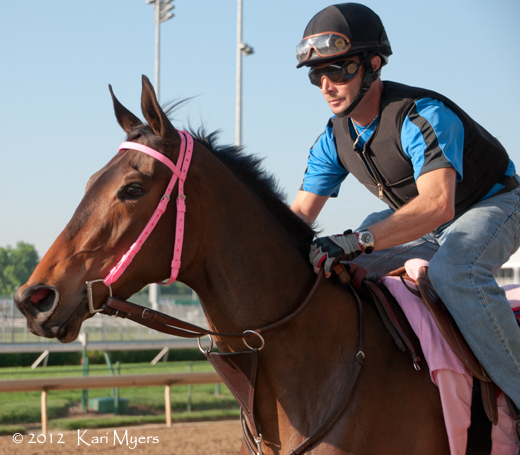 Her connections were hoping to get her into the Kentucky Oaks, but she didn’t quite make the cut. 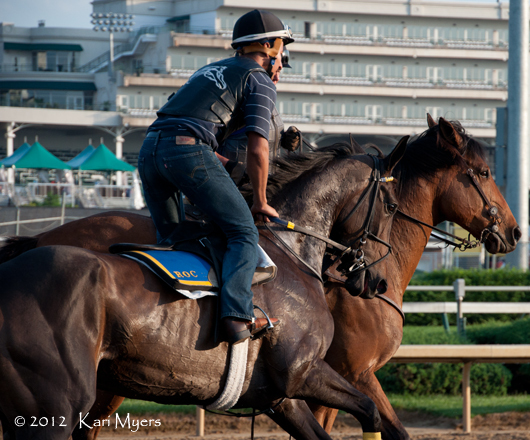 May 3, 2012: Early mornings at Churchill Downs are my favorite way to start a day at the track. It’s often difficult to identify exactly who is who, but they’re all lovely in their own way. As I’ve mentioned before, watching morning workouts is my absolute favorite pastime. I love the hum of activity in the barns and the constant sets of horses entering the track and leaving again to get their morning baths. It’s the only sort of traffic I look forward to! Most horses are identified by their tack as belonging to a certain trainer, but it’s often difficult to tell exactly who a horse is unless you’re familiar with markings and know who you’re looking for. In the case of the two photos I’ve posted today, I don’t have names for either one. However, some stand out to me more than others for several reasons and it’s fun to see their personalities come out on the track and in these pictures. I can only imagine that they might think of these mornings as a big game, where they get to run around and play with their friends who live in different houses—err, barns—in their neighborhood. Some of them are well behaved while others hop and prance around like they can’t wait to get going. Still others are fascinated by all the people along the rail. I was watching one morning in 2011 when St. John’s River (a very close 2nd in the Kentucky Oaks to Plum Pretty a few days later) kept stopping at the rail to reach over and check out all the people. She kept sticking her head over the railing, attempting to steal people’s donuts and see what else they had in hand. It took her rider a few minutes to get her to focus on the track, but it was so adorable that we rooted for her all the more in the big race. St. John’s River gave Rosie Napravnik a second in the 2011 Kentucky Oaks, which she turned around and won in 2012 on Believe You Can, becoming the first female jockey to win the race in its 138th running. 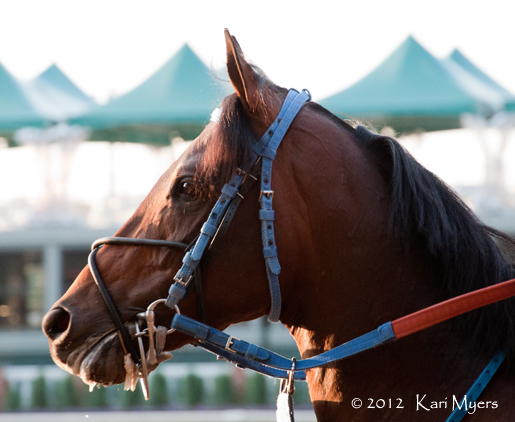 May 3, 2012: Early morning at Churchill Downs. This horse was fascinated by the cameras and kept staring at me instead of paying attention to where he was going. 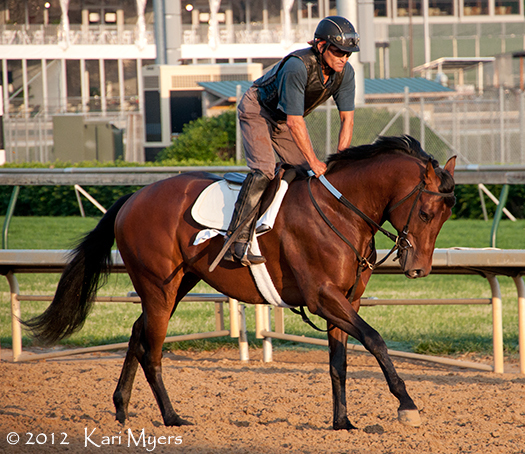 May 2, 2012: Churchill Downs morning workout. This photo was taken during Kentucky Derby week at Churchill Downs, which is one of my absolute favorite places on earth. 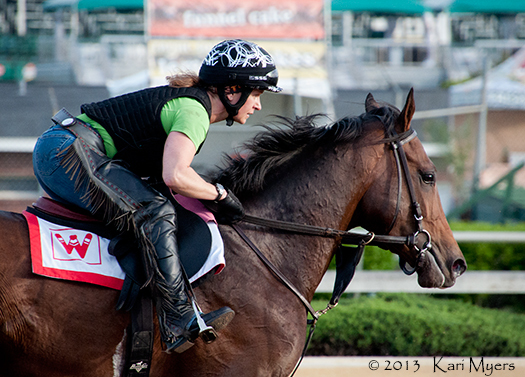 I don’t know who the horse or exercise rider are, but I just love this guy. I am so guilty of concentrating on the horse rather than the rider, but sometimes you just can’t help it. I live in North Carolina, which means there are very few tracks I can get to easily. However, I can drive from my house to Louisville, KY in exactly eight hours. I have the trip down to a science! I try to make the trip at least twice per year, which just goes to show that you don’t have to live next to a track to enjoy racing. If you ever make it to Churchill Downs during Derby week, make sure to visit early in the mornings. They hold Dawn at the Downs for several days prior to the Derby, and it’s a fantastic time to see the horses work out on the track. 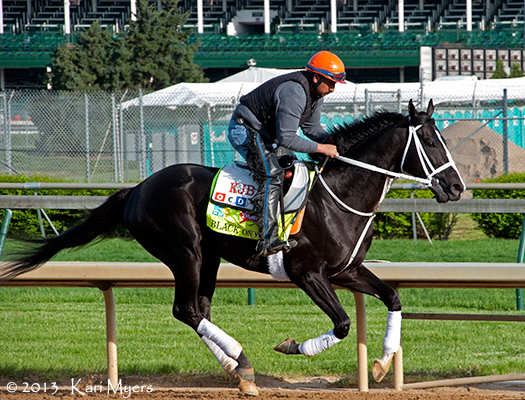 They usually set aside a certain amount of time during the morning where only the Derby and Oaks contenders are allowed on the track, so it’s a must-see event if you’re in Louisville at the time! For a modest price, you can buy a ticket to their buffet and watch all the activity from Millionaire’s Row. Entry is free if you just want to watch from the stands. We always get there early and park ourselves in the seats right in front of the finish line.